Though security concerns are not the primary focus of this web page, below I am keeping a running archive of significant reports and news related to the DPRK’s Yongbyon Nuclear Site. Posts date from February 2007 through the present. 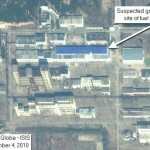 POST 89 (2016-2-1): ISIS has published a report titled “Update on North Korean’s Reactors, Enrichment Plant, and Possible Isotope Separation Facility”. 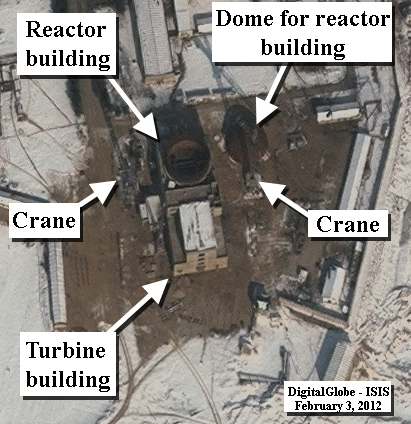 Analysis of recent satellite imagery dated January 25, 2016 confirms previous ISIS assessments that the 5 megawatt-electric (MWe) reactor at Yongbyon is operational, albeit periodically and at reduced power. The gas centrifuge plant at Yongbyon, including its expansion, is likely operational as well. 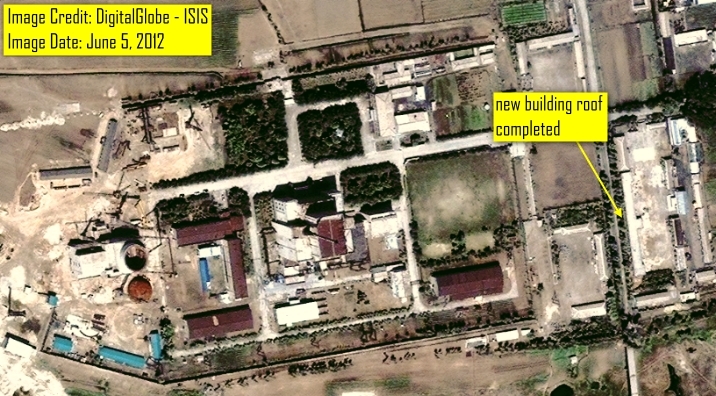 The image also shows that construction is still ongoing at the site ISIS assessed as a possible isotope separation facility, located in the southwest corner of North Korea’s Yongbyon nuclear site. POST 88 (2016-1-14): ISIS and 38 North have issued back-to-back reports on developments at Yongbyon. reduced power. 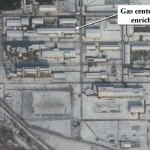 The gas centrifuge plant at Yongbyon, including its expansion, is likely operational as well. The new reactor under construction requires new scrutiny as to its type. 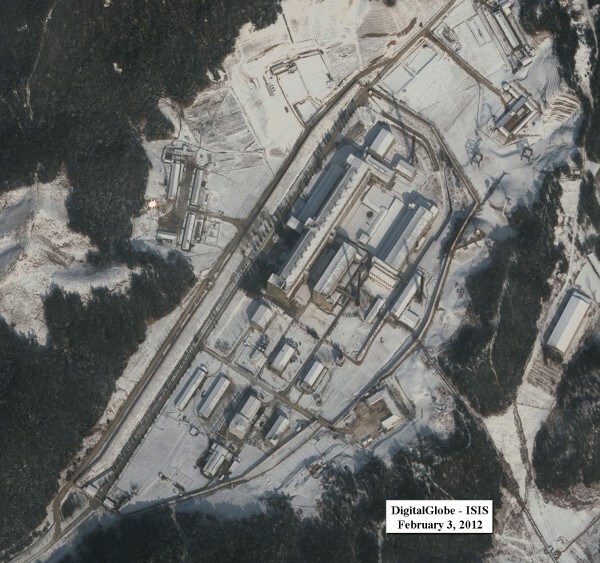 POST 87 (2015-9-8):38 North reports new activity is underway at two areas in the Yongbyon Nuclear Scientific Research Center—the 5 MWe Reactor and Radiochemical Laboratory complex—that are key to the production of plutonium for building nuclear weapons. Read the article here. POST 86 (2015-8-11): IHS-Janes reports that the DPRK may have expanded uranium enrichment capabilities. 38 North reports that uranium production appears to be on the increase. Recent commercial satellite imagery indicates that North Korea’s 5 MWe Plutonium Production Reactor may not be operating or is only functioning at low power levels. The presence of what is likely a vehicle to transport carbon dioxide used in the reactor’s cooling system may indicate that maintenance activities are underway. The reactor appears to have been operating only sporadically since fall 2014 perhaps because the facility is aging. Construction that began in late spring 2015 continues at the incomplete Experimental Light Water Reactor (ELWR). Imagery from July 2 shows that the construction adjacent to the reactor hall can now be identified as a transformer yard to connect the electricity producing reactor to the grid. The yard appears to be complete but all the equipment is probably not yet installed. Once finished, the North Koreans will have taken another step towards beginning initial operation of the reactor. Work also continued at a rapid pace at the Uranium Enrichment complex at Yongbyon. The roof of the building that contains the probable hot cells is nearly externally complete, as is the large unidentified L-shaped building. 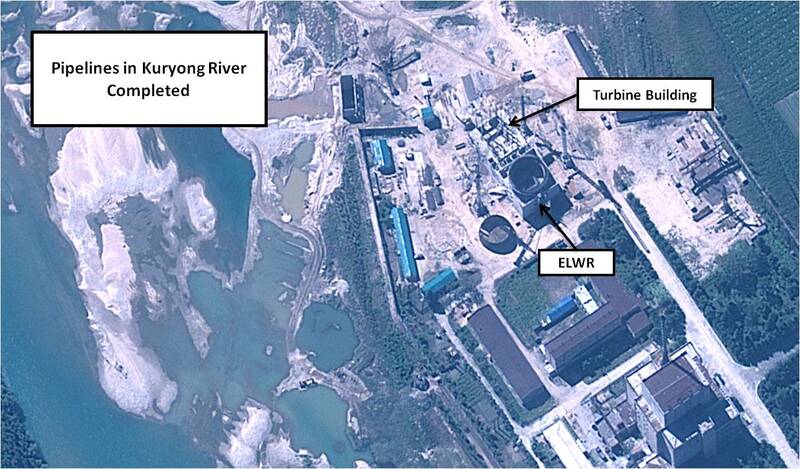 Recent commercial satellite imagery indicates that North Korea has initiated new construction at its still incomplete experimental light water reactor (ELWR) at the Yongbyon Nuclear Scientific Research Center. 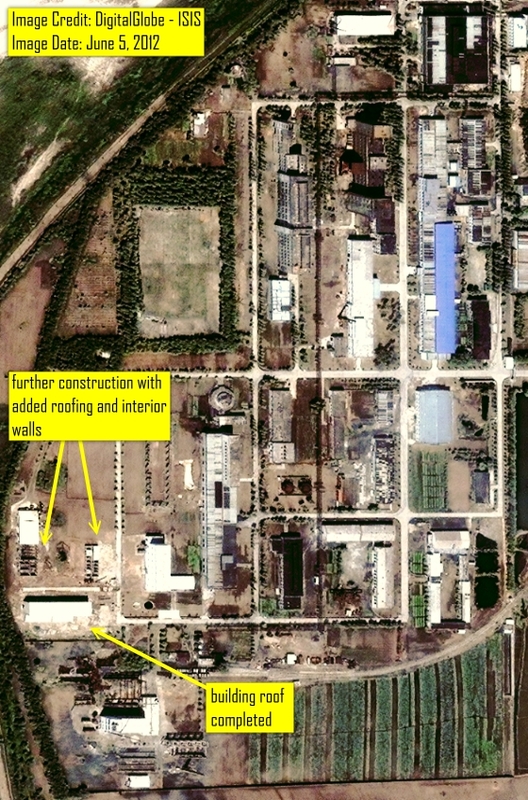 Imagery from May 24, 2015 shows Pyongyang is building a structure probably intended to support transformers and power distribution equipment for the production of electricity. Nearby power lines can be extended to the building once it is completed, allowing the North to begin reactor operations when ready. It remains unclear, however, whether any other additional work needs to be completed before the North can start reactor operations. 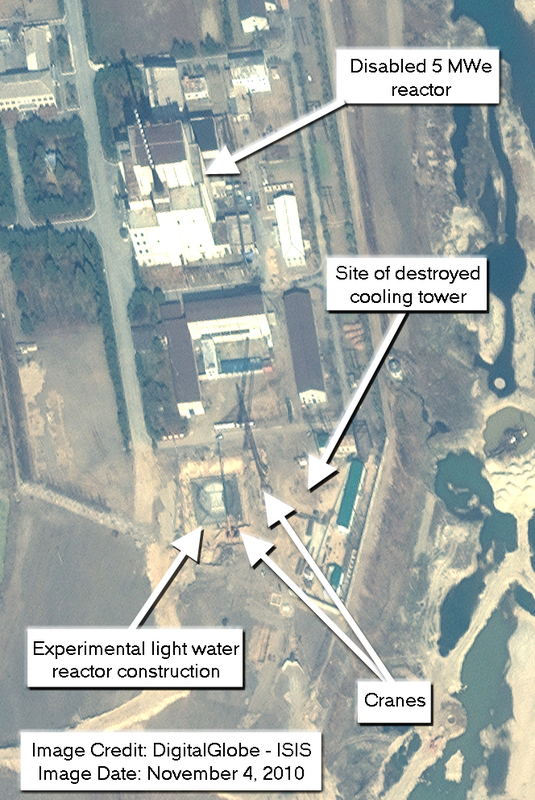 The May 24 imagery also indicates that the 5 MWe Reactor, which appears to have been experiencing operating difficulties since fall 2014, was either operating at low power levels or not at all on that day. 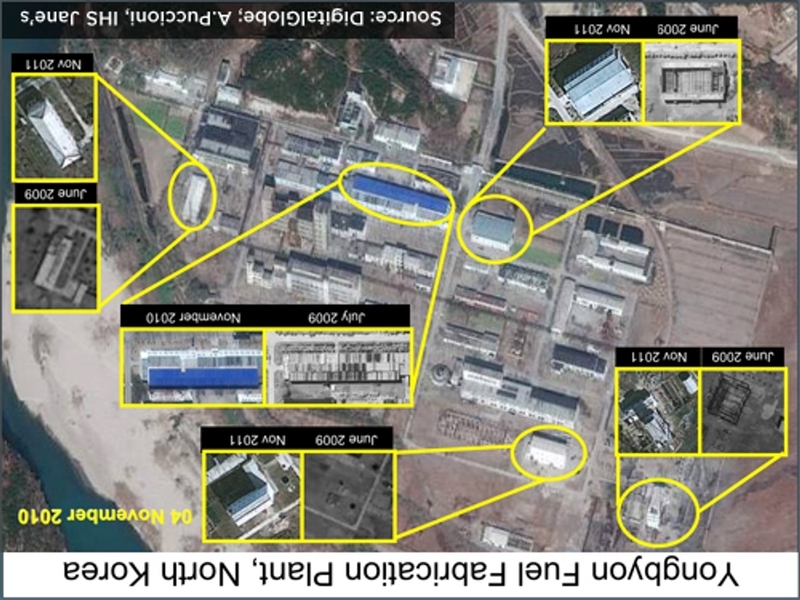 Finally, imagery indicates the possible presence of new hot cells to be used for the remote handling of radioactive material for civilian or military purposes at a building under construction near the Yongbyon Uranium Enrichment complex. Five adjoining, still incomplete, thick-walled rooms at ground level, visible at one end of the structure, appear to be hot cells under construction, although it is too early to reach a conclusion as to their purpose. 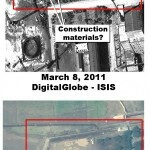 POST 83 (2015-4-29): ISIS reports “A more recent assessment using satellite imagery taken in January, February, March, and April 2015 shows that the reactor may be operating at low power or intermittently. 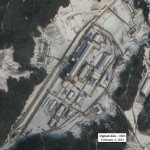 Additionally, the winter imagery shows that the centrifuge plant has operated and that North Korea may be preparing for additional renovations at this site”. POST 82 (2015-3-19): 38 North has been leading a project on North Korea’s nuclear futures. You can read the report, published on Febuary 26 2015 , here. A follow-up report by Joel Witt and David and David Albright, published on March 19, is here. 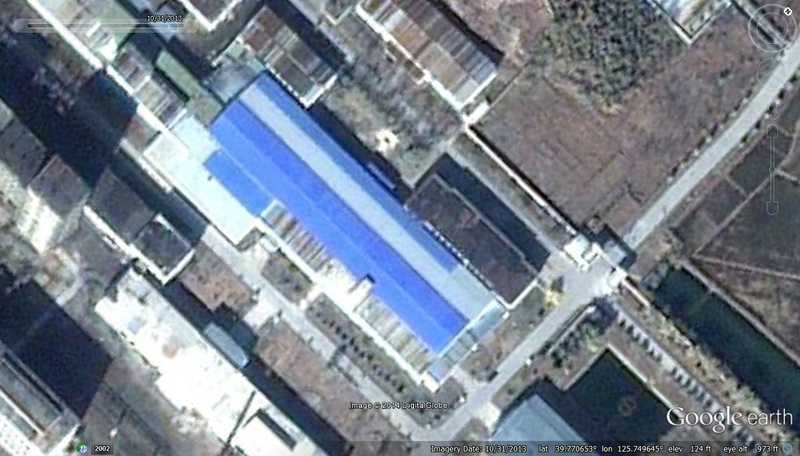 Recent commercial satellite imagery indicates new activity at the 5 MWe Plutonium Production Reactor at North Korea’s Yongbyon Nuclear Scientific Research Center after an almost five-month hiatus in operations from late August until mid-December 2014. One possibility is that the North is in the early stages of an effort to restart the reactor. However, since the facility has been recently observed over a period of only a few weeks, it remains too soon to reach a definitive conclusion on this and also on whether that effort is moving forward or encountering problems. 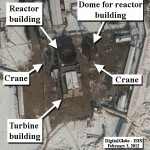 Continuing to monitor the reactor site should provide more information in the future. Digital Globe commercial satellite imagery dated December 1, 2014 continues to show signatures consistent with the shutdown of North Korea’s Yongbyon 5 megawatt-electric (MWe) reactor for maintenance or renovations and possibly some level of fuel replacements. However, caution is warranted: North Korea may also be desperate for plutonium for nuclear weapons and willing to unload the reactor earlier than expected, while also conducting maintenance work on the reactor. 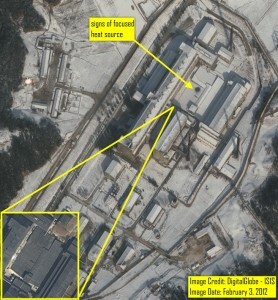 Some signatures are visible at the reprocessing plant located southeast of the Yongbyon reactors, suggesting some level of operation. However, North Korea may also be trying to signal plutonium separation activities without actually conducting any. 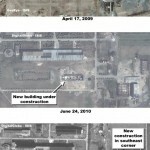 At the enrichment site, located in the southern part of the Yongbyon nuclear site, roof renovations on a building adjacent to the uranium centrifuge building have halted. 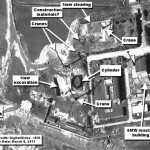 Analysis of imagery dated June 30, August 27, and September 29, 2014, combined with procurement data obtained by ISIS, suggests that North Korea has emphasized the production of weapon-grade plutonium in the 5 MWe reactor as well as enriched uranium for its nuclear weapons program. 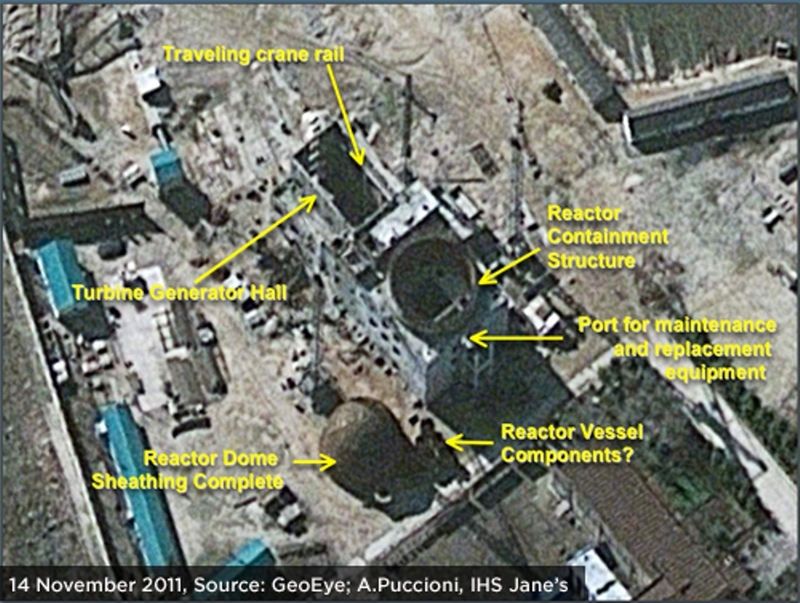 Analysis of more recent imagery dated December 1, 2014 suggests that North Korea continues to work on maintaining the aged 5 MWe reactor and intends to restart it. The start-up date of the experimental light water reactor (LWR) continues to remain uncertain. Infrared cameras used by Korean and U.S. intelligence authorities have detected heat that was emitted when the centrifuges in the new plant began operating, the source said. “We have to monitor a little longer to see if the new plant actually started producing weapons-grade materials, but it is our assessment that it is in operation,” he said. The newly built facility is about the same size as the old one, according to the source, leading to the estimate that it is also equipped with about 2,000 centrifuges. The operation of the new facility is expected to worsen fears about Pyongyang’s nuclear program. Here is more at the Wall Street Journal. Post 77 (2014-10-10): ISIS clarifies the 2014-10-3 report. Commercial satellite imagery dated August 27 and September 29, 2014 show the possible shutdown of North Korea’s Yongbyon 5 megawatt-electric (MWe) reactor, possibly for either partial refueling or renovations. 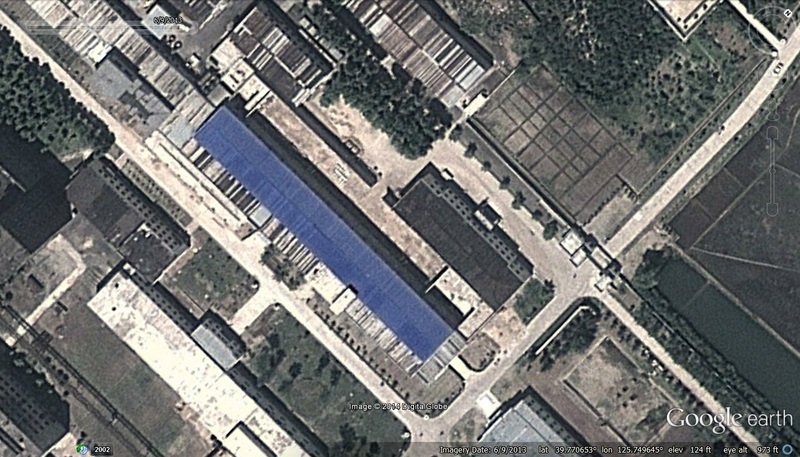 Roof renovations continue on a building adjacent to the uranium centrifuge building located in the southern part of the Yongbyon nuclear site. Analysis of imagery dated June 30, August 27, and September 29, 2014, combined with procurement data obtained by ISIS, suggests that North Korea is emphasizing the production of weapon-grade plutonium as well as enriched uranium for its nuclear weapons program. The start-up date of the experimental LWR continues to remain uncertain. POST 75 (2014-9-4): The IAEA annual report for 2013 lists two sections on the DPRK. The full report can be downloaded here. The DPRK is mentioned on pages 10 and 74. 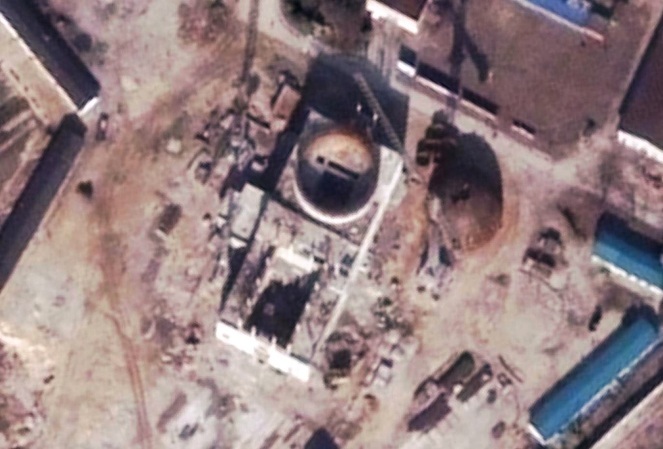 Recent commercial satellite imagery indicates that North Korea continues to experience difficulties in operating its 5 MWe reactor, which was restarted in summer 2013. A new sand dam constructed across the Kuryong River in early March 2014 to help ensure a steady, adequate supply of water for the 5 MWe reactor’s secondary cooling system and the experimental light water reactor’s (ELWR) primary cooling system, failed in two places between April 7 and May 16. A sudden dam failure could cause major safety issues at the operational 5MWe reactor since a reliable supply of water for the secondary cooling system is essential to prevent a dangerous heat buildup in the reactor core. Imagery from early April to mid-May indicates that the 5 MWe reactor was probably shutdown or operated at reduced power levels for an undetermined amount of time. This assessment is based on the absence of white foam discharge—caused by hot steam from the turbines after powering the reactor’s electric generators—from the drainpipe of the turbine building in the May 16 image. The foam reappears on imagery from May 18 and 22, as repair work on the dam started. Imagery from June 22 indicates work at the breaches again, perhaps to repair new problems caused by rain the previous three days. Nevertheless, the foam was present then as well. Exactly why this shutdown or operation at reduced power occurred remains unclear. One possible explanation could be that when it became apparent the dam was failing during the earlier period, the reactor operators worried its loss could cause the river channels to shift further to the east away from their cistern and shut down or reduced the power of the reactor for safety reasons. When that didn’t happen, because the dam did not completely fail and the river water was higher than normal, the decision was made to restart it. Recent commercial satellite imagery shows that North Korea’s 5 megawatt-electric (MWe) reactor at the Yongbyon nuclear site appears operational. 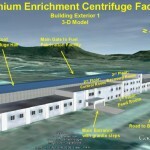 There have not been recent outward signs of the expansion of the centrifuge facility, suggesting that construction of the building is complete and that North Korea could now be installing equipment or even centrifuges inside. 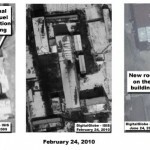 Post 69 (2013-12-5): The Institute for Science and International Security (ISIS) has released new satellite imagery and a report on further developments at Yongbyon. Click here (PDF) to read about changes at the fuel fabrication complex, centrifuge plant, light water reactor and more. 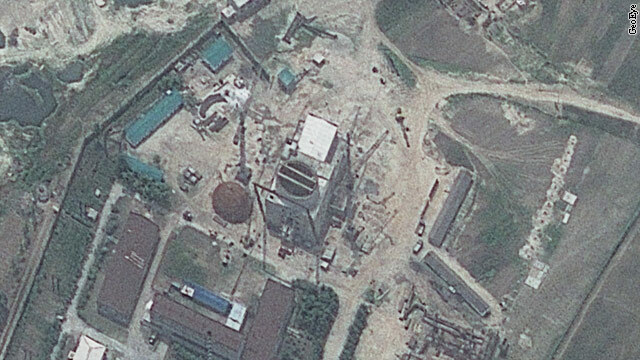 POST 68 (2013-9-11): 38 North reports that the DPRK has restarted its 5mw reactor. New commercial satellite imagery of North Korea’s Yongbyon nuclear facility indicates that Pyongyang is probably restarting its 5 MWe gas-graphite plutonium production reactor. Since announcing in early April 2013 its intention to restart this reactor, work has progressed rapidly over the spring and summer to bring the facility back into operation. In June 2013, 38 North predicted that the reactor would be ready for restart by the end of August. 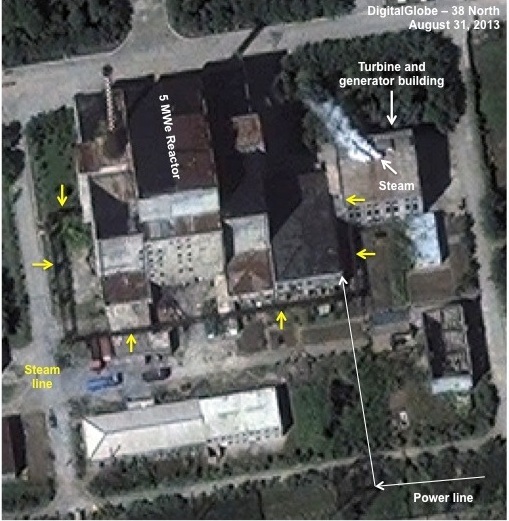 Satellite imagery from August 31, 2013 shows white steam rising from a building near the reactor hall that houses the gas-graphite reactor’s steam turbines and electric generators. The reactor generates electricity by using the heat from the nuclear reaction in the core to create steam that spins the turbines. The white coloration and volume are consistent with steam being vented because the electrical generating system is about to come online, indicating that the reactor is in or nearing operation. The 5 MWe reactor is capable of producing six kilograms of plutonium a year that can be used by Pyongyang to slowly increase the size of its nuclear weapons stockpile. 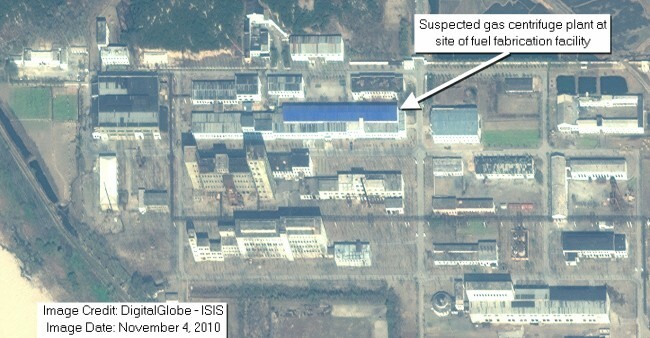 Post 67 (2013-8-7): ISIS Reports recent satellite imagery of the Yongbyon nuclear complex indicates that it has apparently expanded a building in the fuel fabrication complex that houses a gas centrifuge plant for uranium enrichment. The area is now covered by an extended roof that is roughly twice the size of the previous one. Read the full report here. Post 65 (2013-6-3): 38 North reports that new commercial satellite imagery confirms that the DPRK is making important progress in activating the 5 MWe gas-graphite reactor and the 20-30 MW(th) Experimental Light Water Reactor (ELWR) at Yongbyon. Post 64 (2013-5-1): 38 North reports that start-up of the DPRK’s experimental LWR could begin by mid-2013 if fuel is available. 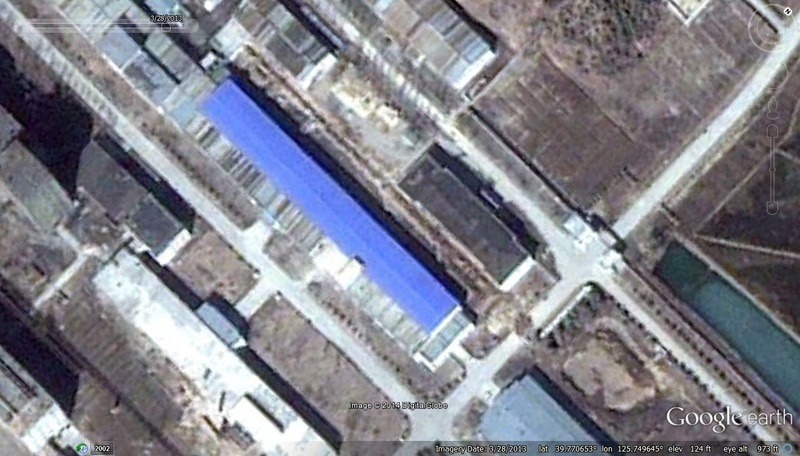 POST 62 (2013-4-3): 38 North publishes new satellite images showing construction at Yongbyon has already begun. 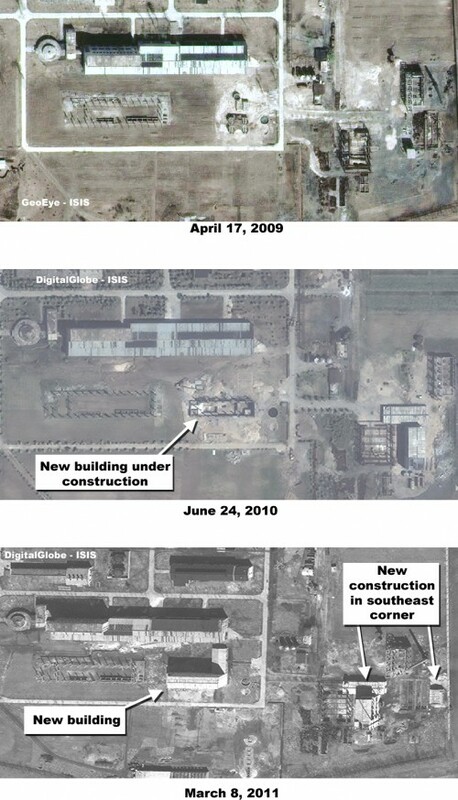 Commercial satellite imagery shows that new construction activity started at the 5 MWe reactor in the six weeks between the beginning of February and the end of March 2013, prior to the Pyongyang’s announcement earlier this week that it intended to reactivate the facility. This will include the measure for readjusting and restarting all the nuclear facilities in Nyongbyon including uranium enrichment plant and 5MW graphite moderated reactor which had been mothballed and disabled under an agreement reached at the six-party talks in October, 2007. This work will be put into practice without delay. The graphite-moderated reactor — along with several related facilities — had been shut down in 2007 as part of a diplomatic deal that sent heavy fuel oil to the North. Pyongyang said Tuesday it wanted to to restart the reactor and other nuclear facilities to ease the nation’s “acute shortage of electricity” and to bolster the “nuclear armed force both in quality and quantity.” Experts who have visited the Yongbyon facility say the small reactor is ill-suited for power production and geared instead to produce weapons-grade plutonium. Plutonium can be culled from the spent fuel that is a byproduct of the reactor’s generating process. When the reactor is fully running, it can produce enough plutonium for about one bomb per year, according to atomic experts. Restarting the reactor will take about six months, “unless they have been doing much of the preparatory work quietly,” Siegfried Hecker, a former director of the Los Alamos National Laboratory who has visited the North’s nuclear facilities numerous times, said in an e-mail. Picture above (2012-8-6). Via the Associated Press. 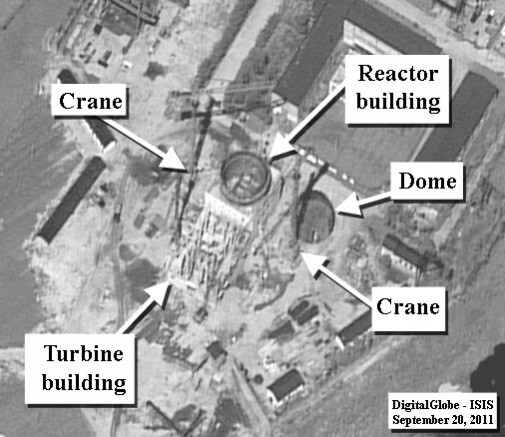 The satellite images taken by the GeoEye-1 satellite on Aug. 6 show a dome has been hoisted on top of the reactor building, Allison Puccioni at IHS Jane’s Defence Weekly said in a statement provided to The Associated Press. “The emplacement of the dome is a significant development, although it may take several more years for the facility to be completed and brought into full operation,” Puccioni said. The dome had been lying on the ground beside the building for a year, she said. POST 59 (2012-8-16): ISIS released a report by David Albright and Christina Walrond titled, “North Korea’s Estimated Stocks of Plutonium and Weapon-Grade Uranium.” Download a PDF of the report here (PDF). On the left side of the image above, cranes and lifting equipment have been erected near the LWR complex for lifting the dome (currently lying on the ground) onto the roof of the reactor building. Additionally, new buildings to the north of the LWR (right side of image) were renovated. In additions to the changes at the LWR site, additional construction is ongoing at the nearby Fuel Fabrication Plant. POST 57 (2012-8-6): In the Bulletin of the Atomic Scientists, Frank Pabian and Siegfried Hecker evaluate the DPRK’s capabilites to date and speculate on a third test. 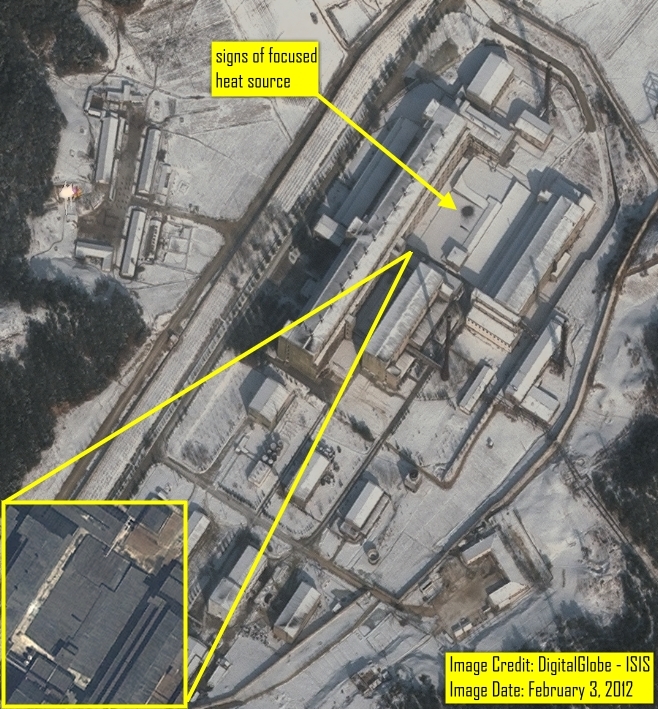 POST 53 (2012-3-5): ISIS has acquired a new satellite image taken on February 3, 2012 of the Yongbyon nuclear site in North Korea which shows that construction of the light water reactor is progressing. In the new image, the reactor’s turbine building appears externally complete (see figure 1). 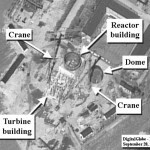 The dome for the reactor building, however, remains on the ground next to the building. An earlier satellite image from September 20, 2011 shows the turbine building still under construction (see figure 2). 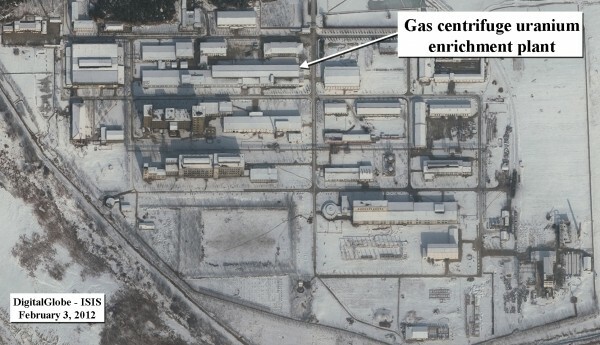 Figure 3 shows the fuel fabrication facility at the Yongbyon nuclear site which includes the gas centrifuge uranium enrichment plant. 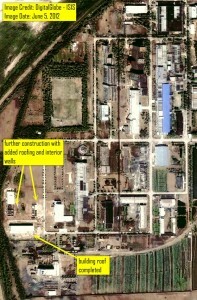 Figure 4 shows the reprocessing facility at the Yongbyon nuclear site. Find more information and the State Department’s press release here. In North Korea, [political] competition is not open and, as far as I can surmise, concerns competing patronage networks more than ideological groups. This is not an unusual state of affairs. Political parties in the United States used to be more ideologically heterogenous, or so I am told, especially in the machine politics that dominated urban areas. Even today, the role of interest groups preserves some ideological heterogeneity within political parties and the political beliefs of one’s parents remain an excellent predictor of partisan affiliation. Proliferation in North Korea, as far as I can tell, is a family affair conducted by one of these patronage networks. This blog has taken a special interest in one Jon Byong-ho and his son-in-law (maybe) Yun Ho-jin, who Josh Pollack described as the “dynamic duo” of North Korean proliferation. It was Jon who is alleged to have written that letter to AQ Khan. And it is Yun who seemed to be in charge of procurement for North Korea and its clients. These two characters, along with a few others, appear responsible for many of North Korea’s more objectionable activities involving ballistic missiles and nuclear weapons. Jon is also a senior figure in the DPRK regime, among the ten most influential North Koreans, as far as DPRK-watchers can infer from issues of protocol, including pictures of who gets to stand with Kim Jong Un, committee memberships and laundry lists like the funeral committee for Kim Jong Il. North Korea’s proliferation activities are more likely structured to support Jon’s machinations in Pyongyang, not the other way around. Whether Jon sees proliferation as a source of hard currency to buy influence or strategic technology to impress fellow hawks, or both, is difficult to say. That makes it very difficult to imagine how the leadership transition could affect proliferation. At least two sources (one , two) describe Jon as an ideological conservative, especially compared to someone like Chang Song-taek. (By the way, I know my Romanization of Korean names is inconsistent and am open to suggestions about fixing that.) Chang may emerge as a sort of regent being married, as he is, to Kim Jong-il’s sister. But Jon, too, is reportedly cl0se to the Kim family and is a part of the so-called “1980 Group” that rose to power with Kim Jong-il. Whether Chang and Jon will act as allies or enemies is not clear to me — and, in North Korea’s opaque system, it may not be entirely clear to them, either. There are people who follow such things very closely who certainly will have plausible answers to such questions, but I think it is important to understand that the internal politics of an authoritarian system are almost certainly opaque to the participants, as well as the outside world. There will be an inevitably jockeying for influence in North Korea, even if only within the context of the preservation of the Kim regime. But many will play their cards close to vest. We should not expect to do better than the participants in handicapping the horse-race. North Korea’s approach to proliferation, therefore, may be determined by factors that we simply cannot see and that are, to a first approximation, not “strategic” in any geopolitical sense. We can not predict them, I suspect, based on a “rational” model that places international interests ahead of domestic ones. See also: No Exit: North Korea, Nuclear Weapons and International Security. Reviews here. POST 50 (2012-1-6): Niko Milonopoulos, Siegfried S. Hecker, and Robert Carlin published a paper in the Jan/Feb issue of the Bulletin of the Atomic Scientists. You can download a PDF of the paper here. I have posted some of the imagery used in the report below. 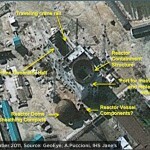 Pictured above: (L) A satellite image of the Yongbyon LWR reactor construction site dated 2011-11-14. 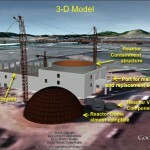 (R) A 3-D model of the facility. 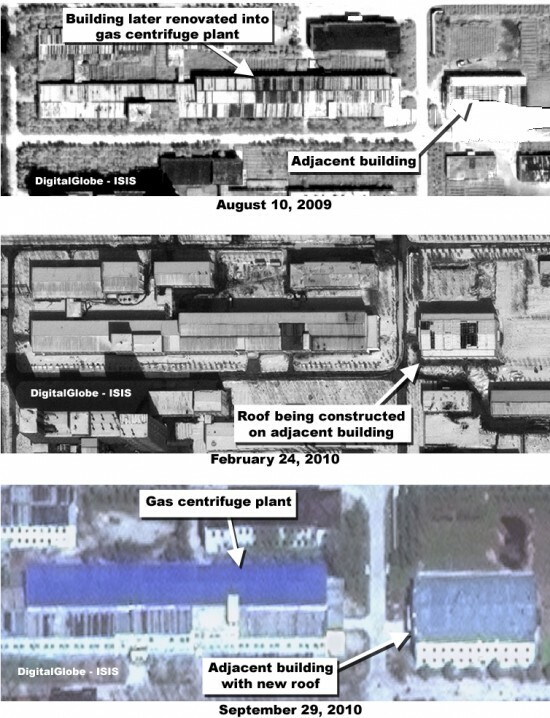 Pictured above: (L) A 2010-11-4 satellite image of the Yongbyon Fuel Fabrication Complex dated 2010-11-4 which shows changes over time. The image was also used in this ISIS report. 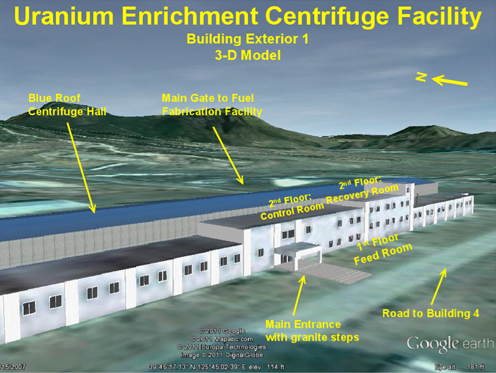 (R) A 3-D model of the centrifuge plant. How will Kim Jong-il’s death influence Pyongyang’s nuclear calculus? Though probably less cataclysmic than some observers anticipated, the death of leader Kim Jong-il in December has introduced new uncertainties into the North Korean picture. There have been notable continuities in Pyongyang’s perspective and basic policies over the past 50 years, and we expect those to remain in place. For example, the North has always seen itself as besieged on all sides, without permanent, trustworthy allies. That has made it suspicious of foreign advice and highly resistant to outside blandishments. With young Kim Jong-un at the helm, Pyongyang may be more susceptible to both external and internal developments. Nevertheless, without significant change in the external security environment — probably much more change than either Seoul or Washington can deliver — we would expect the North to remain a tough customer to deal with. Perhaps the greatest challenge at the moment is to divine how internal dynamics during the political succession — even one well-scripted and moving apace, as the North’s seems to be — might nudge national security decisions one way or the other. In the case of the nuclear issues, the boundaries that we once thought we understood have now become harder to discern. One concern is that the likelihood of nuclear or missile tests over the next year may have grown. During an October 2010 military parade, Pyongyang displayed a new class of road-mobile, intermediate-range ballistic missiles: the so-called “Musudan,” capable of being armed with a nuclear payload and with an estimated range of up to 3,000 kilometers. The Musudan is derived from the Soviet 1968 submarine-launched SS-N-6 missile. Although it has not been flight-tested, the Musudan would represent a major escalation of North Korea’s nuclear threat if Pyongyang is able to build a miniaturized nuclear warhead to fit it — a feat that we believe cannot be accomplished with confidence without at least one additional nuclear test. Further complicating the picture is the North’s long-term fixation on light water reactors as a solution to its severe energy problem. Pyongyang’s goal of energy independence and security, which is married to the notion that a nuclear power industry is a potent political symbol, may not be something that Kim Jong-un is willing to abandon. Unless that idea is either broken or an alternative is supplied (something other than heavy fuel oil, which has become a tattered Band-Aid), the nuclear energy issue will probably remain unresolved. The United States should not challenge Pyongyang’s right to have nuclear electricity but instead provide a more pragmatic energy solution. When the Korean Peninsula Energy Development Organization (KEDO) still existed and was confidentially reviewing options other than nuclear power with Pyongyang, the most promising substitute was natural gas power plants. (The KEDO organization was established as part of the Agreed Framework to provide North Korea with two modern light water reactors, but it was effectively terminated in 2002 after the Bush administration accused Pyongyang of cheating on the agreement.) The problem, of course, was that the North had no infrastructure to handle — much less access to a supply of — natural gas. Recent Russian-South Korean-North Korean consideration of a Russian pipeline might provide new opportunities to revisit the issue. On the upside, diminution of what Pyongyang perceives as an external threat could provide circumstances in which the new leadership might entertain bolder moves — further encouraging tension reduction and experimenting with new approaches on the economic front. For years, the Chinese have advised Washington that even Deng Xiaoping could not have moved ahead with his economic reform program if he had not first been able to reduce the external threats Beijing feared from the Soviet Union and the United States. By encouraging improvements in the security environment, Washington and Seoul could possibly set in motion a series of mutually reinforcing steps that would finally get at legitimate US concerns about both the North’s nuclear weapon and missile programs. 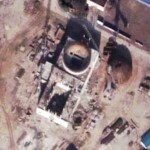 POST 49 (2011-11-14): 38 North has published recent imagery of the Yongbyon LWR reactor construction site. You can read the article here. The Washington Post also covered the story. North Korea is close to being able to produce a small number of nuclear weapons per year through its uranium enrichment program (UEP) at the country’s main nuclear plant, a senior South Korean official claimed Monday. The official claimed the UEP at the Yongbyon nuclear complex is a “small industry” that can be used to mass produce atomic weapons, citing reports that there are some 2,000 centrifuges located there. “It seems that North Korea has completed 70 percent of the process to be able to make one or two nuclear weapons per year,” the official, asking for anonymity, told Yonhap News on the margins of a disarmament conference on the resort island of Jeju. Pyongyang may have spent at least nine years establishing its UEP at Yongbyon, the official said, adding it is hard to monitor the nuclear facility in the communist state. Former U.S. Secretary of State Condoleezza Rice in her new memoir states that senior Bush administration officials were told by the CIA in 2002 that North Korea had constructed a sizable uranium enrichment plant — eight years before Pyongyang declared such activities to the world, Foreign Policy reported on Tuesday. POST 45 (2011-9-19): Jeffrey Lewis has more on the Kahn papers. POST 44 (2011-9-2): The IAEA Bard of Governors has published a timeline of nuclear activities in the DPRK. See the report here (PDF). POST 43 (2011-7-6): A.Q. Kahn claims Pakistan military sold nuclear technology to the DPRK. 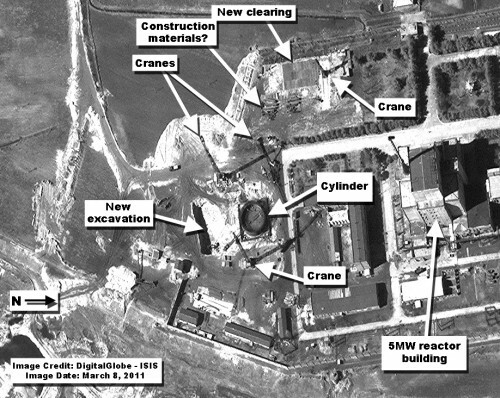 These construction and renovation activities took place after the April 2009 departure of IAEA monitors and U.S. experts charged with disabling three plutonium production facilities at the Yongbyon site. According to North Korea, after their departure, it began constructing the gas centrifuge plant at the Fuel Fabrication Facility. These other construction activities could be related to reactor fuel fabrication, uranium enrichment, or uranium conversion, including uranium tetrafluoride or uranium hexafluoride production. Whatever the exact purpose, these activities show that more is going on at Yongbyon than commonly believed. North Korea should provide information about these new buildings. Above pictures (39.801395°, 125.754409°, Google Maps): Commercial satellite images showing this original pilot fuel fabrication building on August 10, 2009, February 24, 2010 and June 24, 2010. A new roof can be seen in the June 24, 2010 image. The entire building may have undergone a renovation during this time period. Above Picture (39.770379°, 125.750889°, Google Maps): Comparison of satellite imagery showing new roof on building adjacent to the gas centrifuge plant. The new roof could indicate that North Korea renovated the entire building. Above Picture (39.768070°, 125.754132°, Google Maps): Comparison of satellite images of the southeast corner of the Fuel Fabrication Facility. Original structures were deconstructed beginning almost nine years ago. The skeletons of the buildings remained in place for many years until construction of new buildings began after April of 2009. Above Picture (39.768160°, 125.752472°, Google Maps): Comparison of satellite images over time showing the construction of a new building after April 2009. Above Picture (39.769873°, 125.746629°, Google Maps): Comparison of commercial satellite images showing the construction of a new roof on a building on the western edge of the Fuel Fabrication Facility. 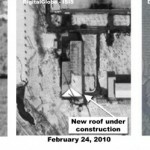 The new roof could indicate that North Korea renovated the entire building. 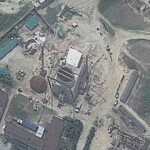 Left image: Commercial satellite image from March 8, 2011 of the new construction near the site of the destroyed cooling tower for the 5 megawatt reactor at the Yongbyon nuclear center. North Korea has stated this is a construction site for a new light water reactor. The cylinder seen in the image measures approximately 21 meters across. There is also a new clearing with a crane and possibly construction materials in an area near the 5 MW reactor. The cylinder may appear to be oval-shaped, however, this is an optical illusion caused largely by the shadows cast and partly by the angle of the image. The diameter of the cylinder remains relatively constant around the circle—accounting for the angle. Right image: A comparison of an area adjacent to the new construction as seen in a November 3, 2010 and the March 8, 2011 image. This area is mostly empty in the earlier image. In the March 2011 image, there appears to be some site clearing, a crane, and what could be construction materials. It is unclear if this area is or will serve as construction support or staging, of if a structure will be built there. A satellite photograph of North Korea’s Yongbyon nuclear complex taken on March 24 shows a dome-shaped structure and construction taking place right next door that were not visible in a surveillance photo taken in November last year. The dome-shaped structure measuring around 30 m in diameter is apparently around 40 m tall. POST 38 (2010-12-20): DPRK agrees to allow nuclear inspectors back into country. POST 35 (2010-12-3): US told the UN nuclear watchdog DPRK likely has more than one uranium facility. POST 32 (2010-11-30): Jennifer Lind and Daryl Press write in 38 North why it is still too early to consider the DPRK a nuclear power. POST 31 (2010-11-24): Lankov on the DPRK’s LWR and uranium sites. POST 30 (2010-11-23): The Korea Economic Institute offers downloads of Dr. Hecker’s speech and power point presentation. You can download his power point here. You can download his talk here. POST 29 (2010-11-22): NPR interviews Robert Carlin. “We were stunned”. To place a new nuclear facility at Yongbyon is to prepare it for exhibition. Nothing else makes that point as well as the easily overlooked third new building mentioned in Sig Hecker’s latest trip report, after the light-water reactor (LWR) and the gas centrifuge enrichment plant (GCEP): “the new three-story Guest House.” Decoded, the message reads: Come visit Yongbyon, where sanctions aren’t working. The exact placement of the GCEP and the LWR-in-progress contain a message of their own. First, as a recent DigitalGlobe image shows, the LWR construction site occupies the area of the disabled 5 MW(e) Magnox reactor’s former cooling tower. (See the ISIS image brief.) Second, as Jeffrey points out, the GCEP stands on the site of the Magnox reactor’s fuel-fabrication building. As I’ve written in a contribution to the current issue of Uranium Intelligence Weekly, these changes almost certainly would not prevent restoration of the reactor to operational status, but they do convey that making plutonium at Yongbyon no longer rates as a high priority. In fact, these look like the very sort of additional and unilateral disablement steps that I had deemed so unlikely earlier. (Whoops.) It’s the sort of action that one might expect North Korea to take in order to signal confidence that it already has all the plutonium it needs. Update, Nov. 23: According to Dr. Hecker, the new developments at Yongbyon would not significantly interfere with restoration of the 5 MW(e) reactor, if desired. It could be restarted in about six months. 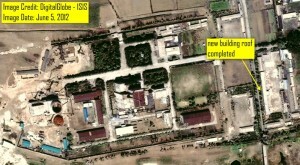 POST 27 (2010-11-21): ISIS offers new satellite images of the DPRK’s new HEU facility. Hecker reports on a modern control room at the plant. ISIS learned that North Korean procurement entities obtained abroad modern computerized control equipment [NKeconWatch: CNC] used to run a plant composed of centrifuge cascades. This equipment is dual-use, also used in the petrochemical industry, but it was the same as those acquired by Iran to run its centrifuges. ISIS did not learn who more recently supplied the plant with frequency converters or the subcomponents used by North Korea to make them domestically, but Iran and North Korea appear in some cases to use similar illicit procurement networks. 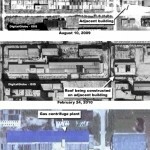 It is possible that the North Korean plant(s) could be vulnerable to the Stuxnet worm. POST 26 (2010-11-20): Dr. Siegfried Hecker’s report has been released. You can see a PDF of it here. The Nautilus Institute has also published an HTML version here. 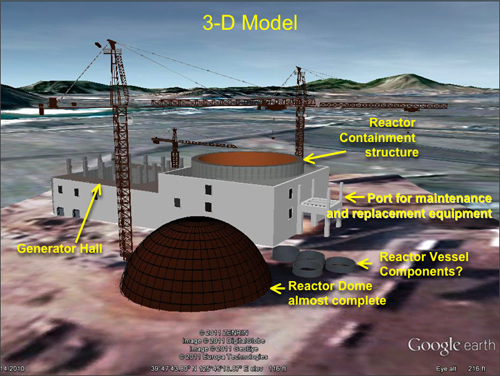 The report discusses Dr. Hecker’s observations of the DPRK’s new LWR and LEU facilities. The New York Times and Wall Street Journal offer some context. ISIS estimates that a 25-30 MWe light water reactor would require several tones of low enriched uranium (LEU) in the core and on order of one tonne of LEU per year as reloads. These values could vary depending on the design of the reactor and whether it will be optimized for electricity production or weapon-grade plutonium production for weapons. POST 24 (2010-11-15): The DPRK’s LWR and HEU program are announced. North Korea’s reported construction of a light-water nuclear reactor, if confirmed, would be a violation of U.N. resolutions banning the communist nation from any nuclear activity, South Korea’s foreign minister said Monday. “That would be running counter to U.N. resolutions and it is obvious that it wouldn’t be conducive to the current situation,” Minister Kim Sung-hwan told reporters, referring to reports that the North has begun construction of an experimental light-water nuclear reactor at its main Yongbyon nuclear complex. Kim said that more time is needed to confirm the reports because the North has no experience in building a light-water reactor. The United States has not reached a conclusion whether it is a light-water reactor as reported, Kim said. An American nuclear expert, Siegfried Hecker, relayed the North’s reactor claim after a trip to the country. Hecker, former chief of the Los Alamos National Laboratory, also told reporters during a stopover in Beijing that he heard the output of the reactor is on a scale of 25 to 30 megawatts. Minister Kim also rejected the North’s claims that it has the right to peaceful use of atomic energy, saying it is a right under the nuclear nonproliferation treaty (NPT). North Korea quit the pact in 2003, just months after the latest nuclear standoff broke out in late 2002. The reported construction raised concerns about North Korea’s attempt to enrich uranium for weapons because a light-water reactor uses lowly enriched uranium as fuel. If highly enriched, uranium can be used to build atomic bombs. North Korea claimed last year that it succeeded in experimental uranium enrichment. The North’s move to let the world know about the construction could be an attempt to pressure the United States and South Korea to resume the stalled six-nation nuclear negotiations, where the country could get economic and political concessions. Seoul and Washington have demanded that the North first take concrete steps demonstrating its denuclearization commitments if the regime wants to reopen the talks involving the two Koreas, China, Japan, Russia and the U.S. The nuclear talks have been stalled since the last session in December 2008 due to North Korea’s boycott. But the communist regime has signaled in recent months that it is willing to return to the negotiating table amid international sanctions on its nuclear test last year and the sinking of a South Korean warship in March. North Korea conducted nuclear tests twice, first in 2006 and the other in 2009, inviting U.N. sanctions resolutions that ban the country from any nuclear and ballistic missile-related activity. Kim reiterated Seoul’s position that firm groundwork should be laid to make sure progress is made if the nuclear talks restart, urging Pyongyang to show its denuclearization commitments through action. He also said that the South does not oppose a summit with the North if that is necessary for moving inter-Korean relations forward, but the country is not interested in holding a summit without sufficient preparation for progress. 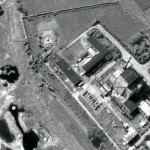 North Korea has started construction of a light-water reactor at its Yongbyon nuclear site in what might be an effort to grab international attention and pressure the United States into returning to nuclear negotiations with the Stalinist state, the Associated Press reported Saturday (see GSN, Nov. 11). The experimental reactor would be capable of producing roughly 25 to 30 megawatts of power, Siegfried Hecker, a former head of the Los Alamos National Laboratory in New Mexico, told journalists in China following a visit to North Korea. The building effort is still very new and would probably require several years to finish, Hecker said. Pyongyang in the spring declared it would soon construct a light-water reactor, a facility that would provide the aspiring nuclear power a justification for enriching uranium. Low-enriched uranium can be used to produce atomic energy while highly enriched uranium can be used to fuel warheads. 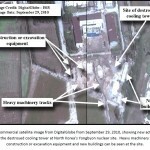 Seoul has knowledge of some activity at the Yongbyon site and must further study Pyongyang’s plans for the complex, an unidentified South Korean Foreign Ministry official said. The alleged reactor work “is a message to the United States that North Korea will keep working on its nuclear programs unless the U.S. comes forward to the six-nation talks,” Seoul-based analyst Kim Yong-hyun said. The six-party negotiations involve China, Japan, the two Koreas, Russia and the United States. They propose to reward the North’s permanent denuclearization with security guarantees and massive amounts of economic aid. Washington has said it would not return to the paralyzed six-party talks until North Korea demonstrates a sincere willingness to denuclearize. Pyongyang has undertaken limited nuclear disarmament steps in the past, only to reverse course once it has attained some international concessions. The North withdrew from nuclear talks last spring and shortly proceeded to carry out its second nuclear weapons test (Kwang-tae Kim, Associated Press/Google News, Nov. 13). “Recent satellite images of the Yongbyon region have not shown any moves going on for the construction of a light-water reactor,” an unidentified South Korean government official told the Yonhap News Agency. “But we’re watching any moves in North Korea closely,” (Yonhap News Agency, Nov. 13). At a news briefing, South Korean Foreign Ministry spokesman Kim Young-sun said, “If [North Korea is] moving toward the development of a light-water nuclear reactor, it goes against expectations of six-party nations or the international community,” the Xinhua News Agency reported (Xinhua News Agency/People’s Daily Online, Nov. 15). Meanwhile, South Korean President Lee Myung-bak yesterday suggested he was not in a hurry to convene a summit with aging North Korean leader Kim Jong Il, the Korea Times reported. “An inter-Korean summit will be possible at any time if it helps achieve the bigger goal of maintaining peace on the Korean Peninsula and denuclearizing North Korea,” Lee told the Asahi Shimbun. Lee and Japanese Prime Minister Naoto Kan agreed yesterday in direct discussions that the North needs to show it is committed to denuclearization before diplomatic engagement is to occur (Na Jeong-ju, Korea Times, Nov. 14). China and Russia, however, urged that the nuclear negotiations be restarted as soon as possible, ITAR-Tass reported today. As host of the talks and Pyongyang’s strongest ally, Beijing has repeatedly called for an early restart to the talks. Moscow has until recently remained neutral in calls for a return to negotiations. “We have confirmed the importance of adhering to peace and stability on the Korean Peninsula and in the region as a whole through a dialogue,” read a joint statement from a trilateral meeting of the Chinese, Russian and Indian foreign ministers. The top diplomats urged “the parties concerned to return as soon as possible to the six-party talks in order to fully implement the Joint Statement of the Six of September 2005” (ITAR-Tass, Nov. 15). “The president of Russia [Dmitry Medvedev] believes it is necessary to reinvigorate any possible contacts to continue dialogue with the leadership of North Korea,” said a Russian official accompanying Medvedev to the Group of 20 industrialized nations summit in Seoul. “Obviously, this topic was discussed in quite a detailed manner at the meeting with the president of South Korea,” Agence France-Press quoted the official as saying on Friday (Agence France-Presse/Yahoo!News, Nov. 12). POST 23 (2010-10-8): The Institute for Science and International Security (ISIS) has published a story on the DPRK’s suspected HEU program. See it here (PDF). POST 22 (2010-10-1): Satellite verification of construction on the cooling tower site. 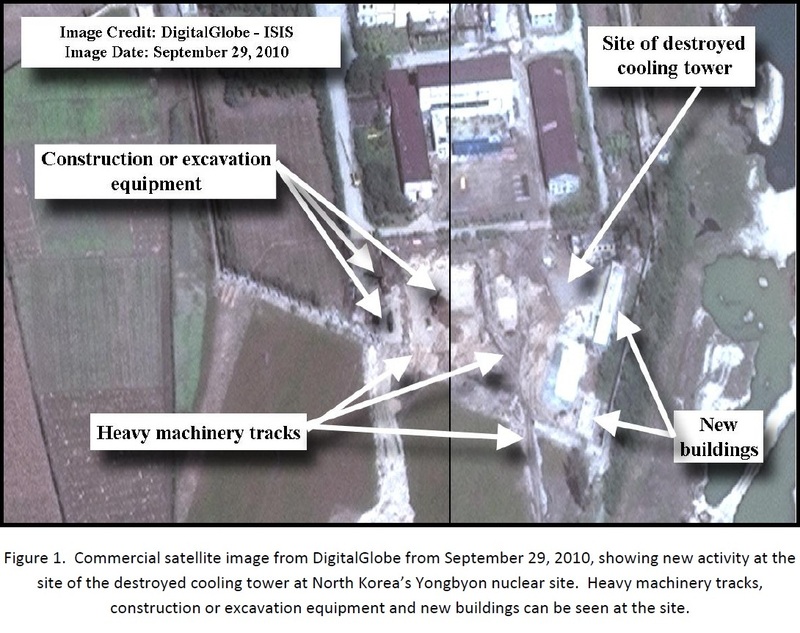 The Institute for Science and International Security has released satellite imagery (dated 2010-9-29) that shows new construction near the Yongbyon 5-MW reactor on the site of the former cooling tower. As of now, we do not know the purpose of the new construction. 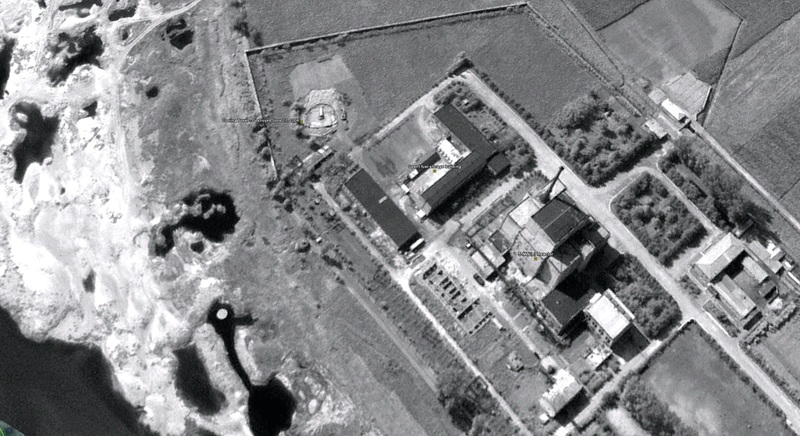 ISIS has obtained new commercial satellite imagery from DigitalGlobe of the Yongbyon nuclear site in North Korea. Taken on September 29, 2010, the imagery shows new construction or excavation activity in the area surrounding the destroyed cooling tower for the 5MW reactor. 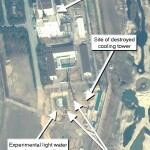 However, there is no indication in the imagery that North Korea is rebuilding its cooling tower. In addition, the new excavation activity appears to be more extensive than would be expected for rebuilding the cooling tower. But the actual purpose of this excavation activity cannot be determined from the image and bears watching. In the new image, there are heavy machinery tracks as well as trucks and heavy construction or excavation equipment at the site. There also appears to be ongoing construction of two small buildings adjacent to the destroyed cooling tower. The buildings do not appear to be for construction support. It is unclear if the activity seen in this image represents preparation for construction of a new cooling tower or preparation for construction of other buildings or structures for some other purpose. The Yongbyon 5MW reactor’s cooling tower was destroyed during a controlled demolition in June of 2008 as part of the disablement phase negotiated during the now-stalled Six Party Talks. Until recently, there was no indication of new construction or excavation activity in the area of the destroyed cooling tower. It was a field with a circular foundation where the cooling tower once stood (see figures 2, 3 and 4). Figure 5 shows the reactor’s cooling tower before demolition. This story was also covered by the Washington Post and Donga Ilbo. North Korea ordered International Atomic Energy Agency inspectors out of the country Tuesday. The decision ends international monitoring of a research reactor at Yongbyon and in theory could allow reprocessing of fuel rods to produce plutonium. The IAEA is expected to announce the eviction in the next hour. The on-again, off-again inspections at the 5-megawatt Experimental Nuclear Reactor Plant and the Nuclear Fuel Fabrication Plant at Yongbyon resumed in October, soon after the U.S. announced it would remove North Korea from the State Department list of countries that sponsor terrorism. POST 20 (2009-1-20): The DPRK looks to sell its unspent fuel rods. POST 19 (2008-9-24): North Korea bars international inspectors from nuclear facility. 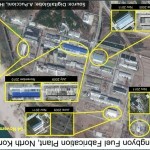 POST 18 (2008-9-21): North Korea has formally requested that the IAEA remove its seals and surveilance equipment from the Yongbyon processing facility. South Korean Foreign Minister Yu Myung-hwan expressed deep regret Thursday over North Korea’s move to restart its nuclear reactor and urged Pyongyang to engage in talks on ways to verify its recent nuclear declaration. Yu confirmed that the North notified the U.S. earlier this week of its decision to reactivate the plutonium-producing facility in Yongbyon. “As North Korea is translating words into actual action, we express concern over it and close consultations with related nations are under way,” Yu said in his first press briefing in nearly four months. North Korea told U.S. monitors working at Yongbyon Tuesday that it would recover the Soviet-era reactor which was being disabled under a multilateral disarmament deal signed last year, according to the minister. Recent history on the US sanctions saga here and here. POST 16 (2008-7-4): According to the Associated Press, the Bush administration is ready to pay $20 million to North Korea to complete the last 3 steps to permanently disable its Yongbyon nuclear reactor. North Korea for its part, says it does not want to address future dismantling work until it receives the goodies it was promised for the first nine stages of Yongbyon decomission. 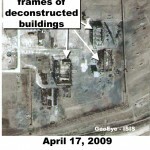 POST 15 (2008-6-27): The Yongbyon Cooling tower has been destroyed. Pictured above: (left) A photo of the Yongbyon cooling tower taken just before its destruction (via AP). (Right) A satellite image of the destroyed cooling tower via a journalist friend. You can see video of the cooling tower destruction here (YouTube). POST 14 (2008-6-26): Pyongyang submits Nuclear declaration. US Treasury says N.Korea sanctions remain in place. POST 13 (2008-4-24): CIA briefs Congress on Syria reactor. POST 12 (2007-10-17): North Korea has pledged to disable its nuclear facilities by the end of the year, and the United States is sending a team of technical experts to Yongbyon to begin the process of putting Pyongyang’s bomb machine to sleep. This article discusses the details of their job. POST 11 (2007-10-3): North Korean nuclear deal reached.